Palm and coconut trees have surrounded me throughout my life — first in Florida, then overseas in the South Pacific, and then again in Florida. As children, my brother and I took hammers and screwdrivers to coconuts we’d salvage from the trees on the island, in a valiant effort to break them open. It’s a wonder that more serious injuries weren’t committed. My poor mother. So in honor of the ever-flexible and almighty palm, bending amid hurricane-force winds and not just surviving, but thriving…. Here are a few retro images. I blew one up for my mother, another military (Navy) brat who spent time at Punahou School on Oahu as a child. That brought up some similar memories! Hammer and screwdriver were apparently the tools of choice for breaking into a coconut! I well remember sitting on the driveway in Miami as a kid and breaking through to the “milk”, drinking it and then smashing the coconuts on the concrete to get at the meat! Hah, thousands of miles apart but the technique remained the same! 🙂 I look back now, and am amazed that those screwdrivers didn’t slip more often… And now, people are buying coconut milk at high $$ because it’s the vogue, healthy thing for you now. Heh! 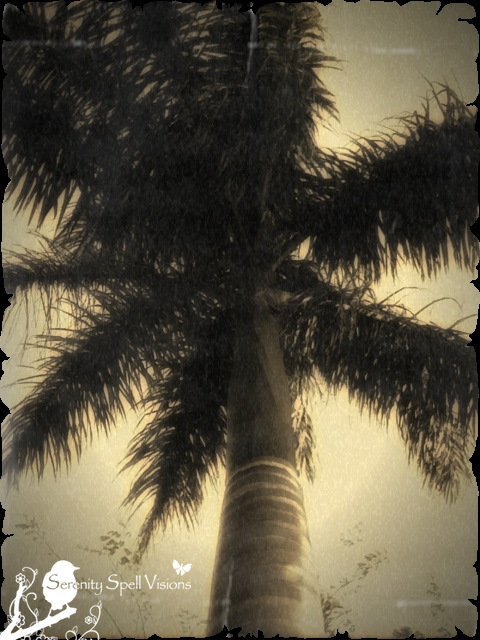 I would LOVE a bit cooler climate, honestly… But I keep finding myself amid the palms! In Liberia, the going rate was five cents – that would send a kid up the palm with his machete tied on his belt, ready to send a few coconuts down! No screwdrivers and such for us, though. The machete splits a coconut just fine! That first photo is marvelous. I’m really fond of that kind of treatment. Liberia — fascinating!! Oh, we had machetes as well that did that job… But my parents WISELY didn’t allow ready access to them. Wonderfull done, I really like these very much! I will! Wouldn’t it be great if our tropical birds ignored it, hahah!! Oh, the sound of the wind — AND rain — through and on the palms is just divine!! There’s nothing like it in the world. It’s so great to hear from people, who have lived throughout the world with these fascinating trees…. Your family’s Mexico, my South Pacific, Liberia, and of course Florida. Oh, this definitely brought back memories of my childhood in Florida. 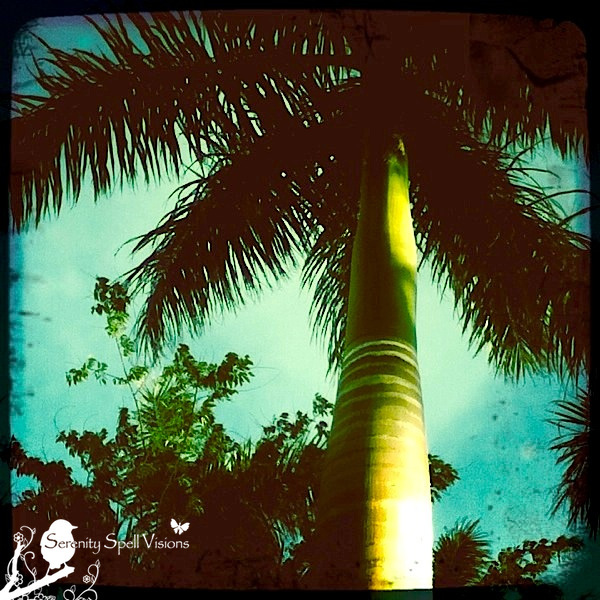 Going to sleep to the sound of the palms rustling in the wind was much like going to sleep to a gentle rain. They were so much a part of my life that even now, all these years later, I miss them. Thanks for sharing this. I once made a quick trip to Florida on business. Went straight from the airport to the meeting and was stuck inside all day. Instead of taking a lunch break, I told my boss that I was going outside to sit under a palm tree for 15 minutes. Got to love those palms! YAY!!! Good for you…. 🙂 There’s nothing like regrouping with the TREES! Honestly, I’m not really a tropical girl (ironically, because I’ve lived in ’em most of my life! ), but there’s nothing like the sound of the wind as it blows through the palms…. Great post treatment. I finally got into WordPress but have not activated it yet. I’m hosting one of those big themes that have lots of customisations. Ah, wonderful!! That’s actually what I’ve done here, believe it or not… (I have Linen.) I wanted a few things I couldn’t access on the freebie themes. I can’t wait to see what you’ve done! Shoreacres mentions coconut palms in Liberia but during my stay there I was much more interested in palm nuts as opposed to coconuts. There was a song “Chicken and rice with palm butter is nice.” Truer words were never spoken! OH I love the second one. I can sit under that tree and drink a pina colada. Hee, thanks!! That’s the one I did for my mom… So ’50s!